First I would like to thank the Oregon Hikers Organization for providing me with valuable information that helped me and friend Bob put together a great 5 day trip around/through the 3 Sisters peaks. Also this is a trip report from a couple of old guys who were mostly concerned about survival but ended up anxious for more such multi-day trips. This trip starting and ending at the Lava Lake Trailhead, Sept. 14-18, 2011. We decided to modify the traditional 50 mile loop around the 3 Sisters with a 35 mile version that cuts through the Middle and South Sister via Camp and Chambers Lakes. The choice to go from the East over to the West was determined by believing that finding the trail would be easier once leaving Camp Lake heading west. We found that it probably did not matter, the trail was well defined all the way. Day one on Sept. 14 (fairly warm day) nearly did me in going 12 miles to Soap Creek. Problem, I was consuming more water than planned and we had been warned that Alder Creek was dry. I did thank God for a strong flowing Alder Creek due to the warm afternoon snow melt. But we did push our old bodies a bit. I’m a 57 year old office guy with 2 artificial hips and Bob is 64. Our packs were about 38 lbs which worked out pretty well, we did end up taking more food then was needed. First night at Soap Creek junction of the trail to Green Lakes and Camp Lake we met backpacker Jeff, a Medical School Intern at Emory. He also started at Lava Lake and was on his last night. His friends had scared him into believing that bears were a problem so he never cooked anything at night in fear of become a victim of a bear attack. He did say he was heading to Bronco Billy’s for all the ribs he could eat and we to ended up there at the end of our trip. After re-hydrating and a good night’s sleep day 2 took us to Camp Lake which turned out to be the easiest hiking day. Luckily we got there before a front came in which brought wind, cold and low clouds. But Camp Lake is a treat especially when it is all yours. This was our critical decision point. Would we be able to climb over the steep wall to get out of the Camp Lake basin. The trail led us to a fairly steep ice/snow covered incline we had to climb with just hiking poles and normal boots. I am so glad we decided to do it because the reward of going down the West side along Separation Creek was exceptionally beautiful. We ended up camping at Reese Lake just North of the trail junction with the PCT. A very scenic location looking up at the South Sister and the lake was warm enough to entice us into a swim. However, that 3rd night was the coldest. We woke up to plenty of frost causing our departure to be a bit delayed. Our goal for day 4 was to get beyond the Obsidian area hopefully to beyond Opie Dilldock Pass. With a late start and late afternoon high cold winds we stopped at Sawyer Bar. The winds were strong and the outlook for comfort bleak, but all this changed by morning to give us balmy temperatures to get an early start. Actually climbing over Opie Dilldock was more work then we expected, but we saved some energy for a climb to the top of Yapoah Crater. Overall this 5 day 35 mile loop turned out to be a fabulous trip. No rain, plenty of water, awesome mountain scenery and wild flowers at their finest. I highly recommend this Sisters cut through but realize that the window of opportunity is fairly short when snow does not clear until late summer. My words of wisdom are to set your goal, be persistent with commitment. Be flexible when trying to include others who may not have the same commitment. Do diligence in preparation will pay off. And don’t underestimate what the human body can accomplish especially when survival depends upon it. Or maybe just “No Pain, No Gain“. And be confident that your next adventure will be that much better but no less difficult. Live long and be healthy. 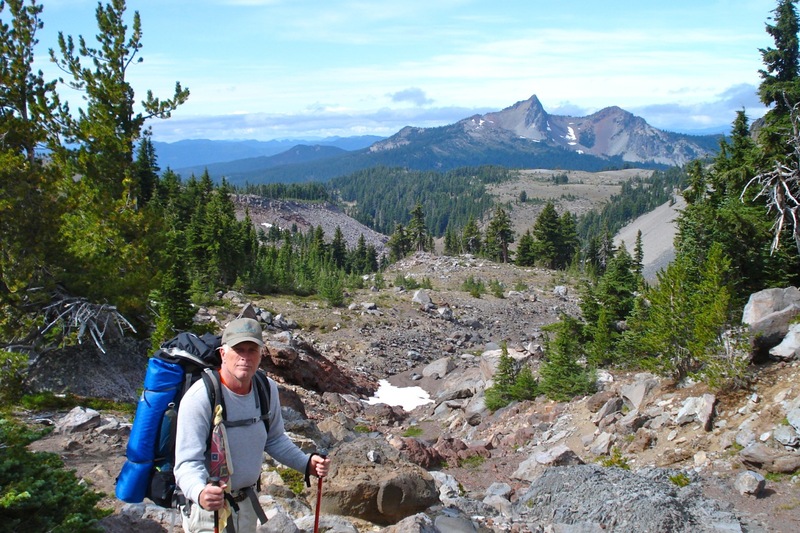 Posted on September 22, 2011, in Backpacking, Oregon, PCT, Wilderness and tagged 3 Sisters, backpacking, hiking. Bookmark the permalink. 2 Comments.